Germany is helping to power the outperformance in European equities as the DAX index nears its all-time high. However, exchange traded funds tracking the German markets could begin to run out of gas as the economy appears to be slowing. The iShares MSCI Germany Index Fund (EWG) has gained 30% over the past year. The Deutscher Aktien IndeX, or “DAX,” has increased 25.1% over the past year. The DAX is currently hovering around 7,708. The Index hit an all-time high of 8106 in July 2007. 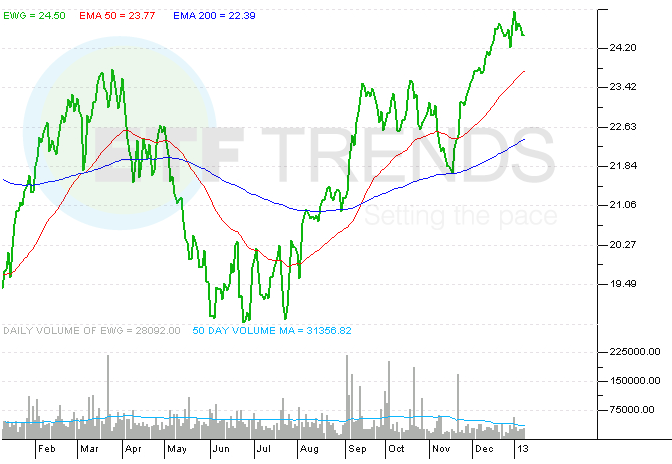 The difference in holdings can explain the variation in performances between the ETF and the DAX. The iShares Germany ETF tracks the MSCI Germany Index, which is follows 85% of the German equity market – EWG currently has 52 holdings. In comparison, the DAX is a total return index of 30 German blue chip stocks traded on the Frankfurt Stock Exchange. While German stocks have strengthened as concerns over the Eurozone financial crisis lessened, the German economy could be slowing. Industrial production only rose 0.2% in November, compared to economists’ estimates of a 1% increase, CNN Money reports. The recession gripping much of the Eurozone has also depressed German exports, which fell 3.4% in November. A recession is defined as a contraction over two consecutive quarters. For more information on Germany, visit our Germany category.